Last night was our last performance on Marine Parade for the summer. We’ve been lucky this year and have performed every Tuesday evening throughout July and August without having to cancel a single performance due to bad weather. 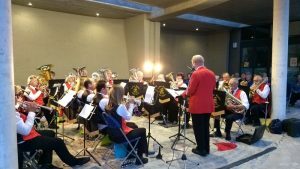 Yesterday evening we had a very full band totalling twenty four players and we played a lively selection of music. Brian, our MD, had canvassed the band for their favourite pieces and we played our top ten choices. We were all surprised to learn that our favourite was Blueberry Hill! As usual Ellis did an amazing job attracting children of all ages to come and join us on percussion, challenging them to play louder than the band and on this occasion they almost pulled it off. Towards the end of the concert Paul, our Chairman, took the opportunity to say a few thank yous on behalf of the band. This year we’ve been so lucky in terms of guest players, many of whom have played with us all summer. These have included John on bass, Bridget on tenor horn, Jo on euphonium, and Geoff and Brenda on cornet. 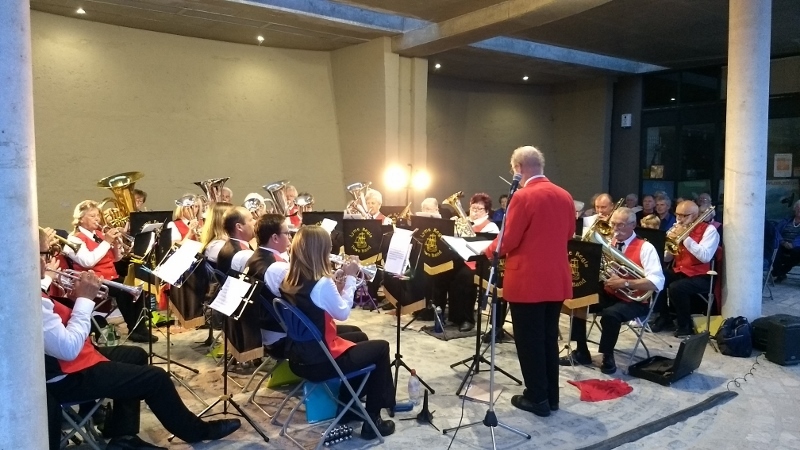 We’ve also been pleased to see Julie on Flugel and Phil who joined us last night on trombone as did ex-player, Peter, who is always a welcome addition to the cornet section. Paul also referred to our loyal band of collectors who have worked so hard for us this summer and he presented awards to Josh and Robert, two young men who have done sterling work for us this year. Sadly we are saying goodbye to Jane on baritone and her husband, Ralph, who not only collects for us but takes great photos. Jane also plays for Stoke Band which is near to her home in Yeovil so she will continue playing. We also said cheerio and bon voyage to Adrian who, as well as being one of our trombone players, is also our Treasurer as he and his wife Jennie are off to Australia for three months. We are going to miss him but hope to have him back with us in the new year. Paul’s final thank you was to our MD for all his hard work leading the band and fronting the concerts. The evening drew to a close with the audience invited to come forward, to link arms, and to sing Auld Lang Syne with us which they duly did. It’s always a sad moment when the season comes to an end but hearing their voices singing along with us was a fitting end to a lovely summer. It’s back to the rehearsal room for us…now where did we put those carol books?